The wealth of information from finding Ardipithecus ramidus (a million years older than the famous fossil “Lucy”) gives us “new insights into the roots of hominid evolution and into what makes humans unique among primates,” says Brooks Hanson, deputy editor for physical sciences at the journal Science, which published a special collection of articles on the species. Similarly to a botanical collection, the differences between the variations of a “type” are illustrated by dissection, arrangement and exploration of important structures—from the whole organism, key generic structures (Sentences, Paragraphs, Subchapters, Chapters) and a comparative focus on comparable branches (first and last chapters). By aging each structural component we can understand the temporal origins of each … and this codification shows the literary organism responding to the scientific, philosophical and cultural environmental change itself engineered. The sentences forming the ‘leaflets’ of the organism are of orange, senescent tones when they will be deleted in following editions. The green, growth tones are applied to those sentences that have life in the following edition. The tone of each color is determined by its age, in editions, to that point. Through these differences in coloration the simplicity in structure in the early stages of the organism’s life develops into a complex form, showing when the structures developed to its changing environment. Around the organisms the textual code is provided, showing the changes in the size of the organism, and where the senescence and growth is derived in that code. A series of re-arrangements of the organism focus on changes at each level of organization. Our friend David Wolman has put together a list of the 10 worst evolutionary designs. At the top? Sea mammal blowhole. Any animal that spends appreciable time in the ocean should be able to extract oxygen from water via gills. Enlarging the lungs and moving a nostril to the back of the head is a poor work-around. Here’s a cool study that shows evolution in action: A team of researchers including Swanne Gordon, a biology grad student at the University of California, Riverside, took guppies from the Yarra River in Trinidad and put them into a section of the nearby Damier River that is above a waterfall. Because of the barrier, this section of the river doesn’t have any predators. The guppies then also colonized the part of the river below the waterfall, where they coexist with predatory fish. How did the guppies adapt to their new environment? Rather well. 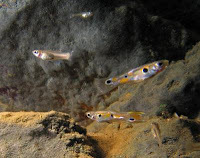 After eight years and less than 30 guppy generations, the researchers discovered that the guppies above the waterfall had produced fewer and larger offspring with each reproductive cycle. High-predation females invest more resources into current reproduction because a high rate of mortality, driven by predators, means these females may not get another chance to reproduce. Low-predation females, on the other hand, produce larger embryos because the larger babies are more competitive in the resource-limited environments typical of low-predation sites. Moreover, low-predation females produce fewer embryos not only because they have larger embryos but also because they invest fewer resources in current reproduction.